Ulan Djaparov. “Cold Head,” 2003. Photo documentation of a performance action. 80 x 120 cm. Courtesy of Ahmady Arts, The Taste of Others. I am pleased to share with you the second half of my discussion with Leeza Ahmady, a continuation of April‘s post. Georgia Kotretsos: Perhaps Asian Contemporary Art Week, (ACAW) and The Taste of Others are the two projects that spell out your name in caps. You create projects that may conclude organically when they have to, and in the meantime you sustain them with great dedication. Is this a personal or a professional commitment? Leeza Ahmady: Public education is a key component for both projects. It begins with self-education, which for me is a process of unlearning or making sense of all the “dead information” that one accumulates through conventional study. The task of maturity is to navigate through that jungle and that is what some people call “The School of Life.” I am not interested in positioning expertise, rather in creating both a personal and professional platform for inquiry and ways of confronting inertia and ignorance about very compelling, unexplored subjects in contemporary art practice and art history. At the end of each ACAW edition, essentially a biennial event involving interaction with hundreds of artists and dozens of arts institutions, I vow never to do it again. Yet the very intense exercise in scoping, identifying, listening, framing, and channeling of artistic activity, which ACAW entails is a marathon I love to run. It is both exhausting and invigorating with many stones still left unturned. History, people, communities, creativity, conflict, entropy, and psychological and philosophical exploration are ongoing dimensions in the world. Which is why there seems to be no end to the projects. With every round, I arrive to new beginnings and approaches. Cai Guo-Qiang. The Century with Mushroom Clouds: Project for the 20th Century, 1996. Presented at ACAW 2008. Solomon R. Guggenheim Museum. The Taste of Others alludes to the fallacy of seeking objectivity in taste, or ways of being, doing, living, thinking, creating, etc. Art and taste feed off each other, as does the individual and the collective, but how our tastes evolve is dependent on our collective programming. How to engage with tastes not of our own collective conscious? Empathy is one way. For example to comprehend the taste of (or the practice of) eating with one’s hands, one must abandon the fork, at least for a while. Art in Central Asia is a taste I seem to continue needing to explore. At the core is the acknowledgment that there is so much more beyond what I alone can convey. Public programs are therefore also a means of recruitment, prompting others to venture into tasting this subject profoundly on their own. University talks are particularly important to inspire students to focus their research and/or to expand their considerations of art history and how it is written and translated. Alexander Ugay. “Still from Bastion,” 2007. Video transferred from 8mm film, 3D. Duration: 5:09. The two projects naturally feed one another. When I took directorship of ACAW in 2005, I felt I was entering a school where I am both student and teacher. There was a small consortium of interested museum curators, collectors and gallery owners that supported the initiative. I saw my entry into their fold as linking to larger dialogues about a very complex geographical and conceptual space called Asia. The term “Asian,” precisely because it is problematic, belongs in the title. It has served as a reminder for me to continue problematizing categorical perceptions and representation of artists, countries, people and ideas while tying them together into broader conversations. This has meant enrolling non-Asia focused NYC institutions to join the consortium and inviting artists from many of Asia’s less visible regions to participate. Paradigm shifts also contribute to change. As we apply new angles each year, the layers of ACAW unfold and I am forced to re-learn its workings. Many galleries have closed in New York City establishing themselves more solidly in thriving cities such as Hong Kong and Dubai. Activities in Asia have grown, are diverse, and critically viable. In response, I am working on expanding ACAW by adding a new consortium of institutions based in cities across Asia. GK: This one comes from the heart: it’s about art publications. Last Spring, The Killid Group (TKG) began giving new life to the culture magazine, Sapeda (1997-2001), and through dOCUMENTA (13) you also became involved in structuring a critical art magazine in Afghanistan. On Skype we briefly touched on the freedoms one has to consider. What kind of conversations are you hoping to motivate in the region and beyond? And how is this project evolving? dOCUMENTA13 Opening in Kabul, Afghanistan, Bagh-e Babur Gardens Courtesy of AhmadyArts. LA: As mentioned in your introduction, I participated in a series of seminars and workshops presented by dOCUMENTA (13) in Kabul this past February. While each workshop topic was designed to create exchange for new methods of thinking, perhaps the most provocative was the idea of creating a critical art magazine – critical being the key word. Alongside Mousse Magazine staff, a few of us led exercises meant to draw attention to both the conceptual framework of imagining a magazine, to imagining a product, to imagining what it means to write about art. To that end, independent curator Raimundas Malasauskas led participants through a session characterized by his ongoing project The Hypnotic Show. Tapping into the enduring relationship between cognition and art, Malasauskas shared an audio recording meant to induce a trance-like state whereby the participants experience an exhibition in their mind. While the vast majority of participants did not understand the language of narration, they were still able to access imagery induced by the narrator. The exercise led to very insightful discussions about time, space, imagination, and ended with many questions, including the difference between an artist and curator. 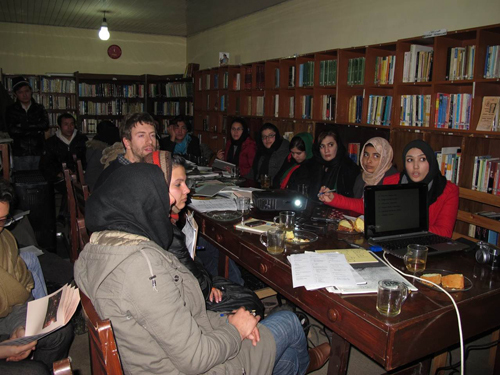 Installation of video and transcripts from the art seminars presented in Kabul and Bamiyan, Afghanistan dOCUEMENTA (13). For my own session, I introduced a level of intimacy not often breached in daily life. In the American society it is not uncommon to be questioned on what you desire out of life, and it’s even more common to voluntarily vocalize it. So in testing the thought processes of the Afghan participants, I posed the following set of questions and asked them to list as many answers as possible: “What are your skills?” “What do you like to do?” “What do you not like to do?” “What do you want to do?” …The questions seem rather ridiculously simple, yet the participants were dumbfounded. They had never been asked anything like it, not by parents, not by teachers, and they quickly realized as they listed their replies that they had many answers that surprised them and that many were even contradictory and that they had in a way taken an internal photograph, a mapping of themselves for the very first time. From these examples, you can see that the underlying ideas presented were not focused on the technical creation of a magazine. They were also not tailored to what it means to have a critical discourse specific to the Afghan situation. Before these practical conversations could be had, we wanted to engage in unconventional methodologies to open a process for exchange and to tap into each and every participant’s own critical and thinking abilities, desires, and expression. “Creating an Art Magazine: Testing the Grounds / Finding the Language,” seminar presented in Kabul, Afghanistan, February 2012 dOCUMENTA (13). Of course, there is also a very practical intent to this initiative. Primarily the resulting magazine will be a mechanism for awareness and communication, connecting artists and arts organizations to each other and their audiences, many of whom still prefer print media over digital or, more correctly, have better access to the former. I am hoping that the publication will create a deeper awareness among individuals and organizations throughout Afghanistan, and in effect tie the community into a more cohesive, collaborative group. GK: Right about now a periodic exhibition of Afghan and foreign artists is taking place in Kabul and Bamyan that attempts to imagine and express a life beyond war and conflict in Afghanistan. An inventive visualization exercise foresees the future of the country, yet I’m left to wonder why now? Do art and peace go hand-in-hand? LA: I returned from the opening of the exhibition in Kabul only three weeks ago, so I haven’t had time to digest things entirely. I can think mainly in adjectives right now. It was an experience tremendously positive, yet unsettling, happy and frustrating, aimless, while productive, incredibly generous, and meaningful. The project in its entirety was an undertaking, a grand poetic gesture, profound and beautiful in bringing many people and art works together. Dozens of individuals, local and international organizations, and private and governmental agencies collaborated, many for the first time, which in itself is a great achievement. Some of my favorite artists from around the world had an opportunity to make what in some cases was their best work. Of course there were many problems, discussions, arguments, opinions, disagreements, disappointments, and derailments. There was some synchronicity and process, inclusion, exclusion, and errors, some corrected, and many unnoticed, so much more to reflect on. I felt listened to, admired, provoked, ignored, offended, and appreciated. It was a total experience I may not eloquently put into words without diluting insights gained. In response to your question “why now?” I think it is a matter of how long it takes for dreams to be dreamed. Or how they expand to manifest as reality. I am not sure who dreamed what first, I thought it was my dream, yet there were dozens and dozens linked and looped by Carolyn Christov-Bakargiev, essentially a brilliant dream weaver, who followed Mario Garcia Torres’s dream to track artist Alighieri Boetti’s dream of Hotel One, which he opened and lived in the 1970’s in Shāre Naw, Kabul. All of which got looped into many other dreams such as Michael Rakowitz carving stones in Bamyan, Barmak Akram becoming a ceramicist in Istalif, Francis Alys filming children’s street games in the Old City, Mariam Ghani digitizing decades worth of Afghan Films, Zalmai adding sound to his photos, Adrian Villar Rojas building a massive mud wall in the middle of a palace garden, and so on, and so on. My own dream to share The Taste of Others project finally with Afghans in Afghanistan was suddenly as real and alive as being back in Kabul was normal and extraordinary. There I was inside a rented wedding hall in the midst of a gorgeous and freezing snow blizzard, pinching myself awake to five hundred students and professors of all ages, listening to me speak to them about art in their neighboring countries. After nearly two and half years of secrecy, much has been debated and a lot has been said about motivations behind dOCUMENTA (13) in Kabul. It was an emotional journey for me to return to the city of my childhood twice in one year after more than two decades. I don’t wish to speculate on art and peace going hand in hand together in general terms. I believe art is a moving force, for individuals, to love, to acknowledge, to connect, to understand, and to heal. My work revolves around creating educational experiences, so my interest here was no different. Invited international and Afghan Diaspora artists, curators, thinkers, and writers, led seminars, while participants were mainly Afghan artists, students and art professionals. Above all, I envisioned a forum for reciprocity. Everyone could benefit by exchanging ideas as opposed to posturing ideas from positions of superiority or inferiority. I think we were mostly successful in achieving this but naturally not always. There was a beautiful moment sitting after many hours of seminars at Zolayzha Sherzad’s studio with philosopher Christophe Menke, when our long discussion ended with this thought: “It is not that Afghanistan needs dOCUMENTA (13), but that dOCUMENTA (13) needs Afghanistan.” Artists travel to places to make art, while exhibitions make discourse. What’s important now is to reflect on what’s done, and how to continue. At a dedicated conference in Kassel, I proposed that all of us involved think about what we might have comprehended, if anything different, through the making of an experience in Kabul/Bamyan that was not part of our consciousness prior to that experience. For myself, I realized that with all our good intentions, great intelligence, and wonderful hearts, we have much more work in the realm of listening, receiving, and creating a true sharing/decision-making process. For more on art in Afghanistan, I am contributing a field report as part of ICI’s Dispatch in late September with texts, images, audio and video recordings. GK: Any highlights ahead we should keep an eye out for? LA: Terry Smith in his textbook, Contemporary Art: World Currents, renders the starting point of contemporary art by delineating artists and movements from 1970 forward as the beginning of an art that is of the world. This is connected to the phenomena of artists traveling to live and work in cities, countries and regions other than their own over the past three decades. Yet the practice of a few lone and brave artists venturing out to remote places on their own is now fully institutionalized. Artists’ residency programs have sprouted across museums, universities, and other arts organizations. A generation of thirty- and forty-something successful artists today will list at least a dozen local and international residencies in their resumes. Barmak Akram, installing his work “Phytomophismes” in Kabul, Afghanistan. After keen observations, I see residencies unparalleled in their positive impacts on artists everywhere. There is a basic lack of critical education and practical opportunities for artists in many parts of the world. Many are far removed from transnational art centers. They are rooted and at times trapped within their given environments. They complain about societal, familial and academic expectations, which deter experimentation with new formats, mediums, and individual pursuits. Artists need diverse and ongoing channels to feed their practice and to evolve their work over time. This requires greater collaboration between artists locally, supplemented with exchange opportunities abroad. Abul Qasem Foushanji. Untitled, 2012. Multi-channel sound installation, black marker pen on wall. Courtesy of AhmadyArts and the artist. I’m seeking to offer artists time and space away from their routine to see themselves and their work in light of new contexts. It’s happening across the board in my work in multiple formats, which is very refreshing. For example, instead of an exhibition, I am co-curating a two-month long NYC based residency program to bring ten contemporary artists from Cambodia to New York as part of a major multidisciplinary Cambodian art festival. (April 1-May 31, 2013). Vandy Rattana. “Bomb Ponds,” 2009. Digital C-prints. “Season of Cambodia,” 2013. Courtesy of SA SA BASSAC and AhmadyArts. My recent trips to Afghanistan and India have led to developing residencies for artists and curators between the two countries and beyond. A large exhibition for Fall 2013 at a gallery in Taipei will focus on artists who purposefully resist location and the de-territorialization of the origin of their body of work. Again, this residency-esque development of artistic practice beyond location speaks strongly to contextualizing process, not artists or objects. Dialogues in Contemporary Art hosted by ICI is similar in spirit, where artists and curators are interviewed about select projects, from idea to inception. Audiences relish being included in the journey, the stories, motivations, struggles involved in making and exhibiting art. These are just a few activities in the works, but overall I’m excited to be on a path that I feel fulfills my personal character as much as it meets certain needs that are sometimes forgotten in curatorial work. Lim Sokchanlina. “Former DeyKrohom, East Wall, between Sothearos Boulevard and National Assembly Street,” 2009. Digital C-Print. “Season of Cambodia,” 2013. Courtesy of SA SA BASSAC and AhmadyArts. love you dearest Leeza for your bravery, for achievement of your devotion for your understanding and educating! the pat that we all want to fallow….